Interview with Laura Best, and book giveaway! It is my pleasure to welcome author Laura Best to my interview chair for a second time as she was the first author I interviewed here. Laura, who has lived in a small Nova Scotia community all her life, is the author of the award nominated “Bitter, Sweet“, and more recently “Flying with a Broken Wing” – my review of which you can read here. Laura has been published in literary magazines across Canada, and in 2003 her short story “Alexander the Great” was nominated for the Journey Prize. Now on with the interview! Now we can discuss that project since it has come out into the spotlight as the young adult novel “Flying with a Broken Wing”. First, to address the obvious, you seem to enjoy writing fiction based in Nova Scotia. Why Nova Scotia? Often, we tend to think that books happen in other, more exotic places, and not in our own back yard. When I was growing up, I never read a story set in Nova Scotia. I wouldn’t have even thought that was a possibility. I might even have thought it would be boring. I’m happy to know that is changing and there are many wonderful books out there that are set right here in Nova Scotia. For those of us living here, I think it gives us a sense of pride to have our home province as a setting for a book. And while Nova Scotia might not be exotic to me it might be for people living in other places. I love this province! It’s what I know best, that and rural life. Most everything I write also has a rural flavour to it. It’s a large part of my identity. I love this province, too, Laura, and it makes me glad to find books that are set here. Your writing is doing Nova Scotia justice, for sure. I’m always impressed and fascinated with the ideas that come together to create well-rounded characters, their life stories, communities, even worlds. Where did the idea come from for “Flying with a Broken Wing”, and how long did it take you to fit this novel together? The book started out with the idea that I wanted to write a story with a visually impaired protagonist. My writing usually begins with the idea of a character first. While I begin with a broad idea of what will happen most times the character leads me through the story. Situations crop up as I write. In the beginning, I didn’t know for instance, that my main character’s caregiver would be a bootlegger or she’d make friends with a boy whose father was a “drunk and a bully.” These things emerged along the way as Cammie told her story. You’ve given a good example of what a little time away from a manuscript can do for an author to finish the story. I’m very glad you continued it. Did you have to do any research to make this story believable? There was very little research required for the book, just a few small facts to check out to make the story more authentic since it’s set in 1949.When writing a story with a historic setting it’s important to know what was going on in the world at that time. In one place, Cammie makes mention of a movie star whose legs were insured for a million dollars. I love these little details and find them quite interesting. For instance, the Standard magazines, that were mentioned several times, are magazines I actually have from when the queen and king toured Canada right before the Second World War. I’ve always loved looking though those magazines and knew it would fit into a story one day. You are a fine example of ‘write what you know’. 🙂 “Flying with a Broken Wing” is an intriguing title, and very suitable. How did you come up with it, and was that always the title you had in mind? More importantly, the title suggests that we can fly in the face of adversity, just as the main character, Cammie, does. We all face hardships in life. We’re either born into it or we encounter it along the way. We can allow these things to define us, and accept our limitations for what they are, or we can do what some might say is the impossible regardless of our life’s circumstances. I think it’s an important message. “Flying with a Broken Wing” works so much better! Who or what inspired you to make your main character visually impaired? Writing a visually impaired protagonist was challenging because I knew I’d be entering a world that’s totally foreign to me. Not only did I have to let the reader know what Cammie could see (or couldn’t see) her other senses had to come into play as well. I had to make sure the reader understood Cammie’s visual impairment and I had to do it in a believable way. My mother is visually impaired and has been since birth. I decided that Cammie would experience the world the same way my mother does. When Cammie takes her glasses off to read up close, or her ability to read Aunt Millie’s moods by listening to the sound in her voice and her body language, these are things I borrowed from my mother. Several times through the writing of this book I’d call and ask her to explain what her range of vision was with and without her glasses on. You did an excellent job of portraying that; your mother must be proud of the results of your work. In this book you have several very interesting and spunky characters. Do you have a favourite, and why? I do love Cammie, but her aunt Millie might just be my favourite. Many people have expressed their strong dislike for Millie, and she’s certainly a hard nut, there’s no denying that. She’s self-centered, tough, and a known liar. But she’s more than that. She’s a product of her environment, someone who does love but doesn’t know how to love very well. Her toughness is a matter of self-preservation. She’s a bootlegger. She has to be tough. Perhaps Millie’s my favourite because I don’t judge my characters. I simply observe their actions. I don’t become upset by what they do or don’t do. And then, of course, I know a bit more about Millie than everyone else. She comes off as cruel, not only because she’s physically abusive, but because of the lies she’s told Cammie over the years. But we can take heart in knowing that Millie didn’t simply invent these lies to be cruel. There are reasons for the things she’s told Cammie. We just don’t know what they are. I think that’s the way it is with the people in our lives. How many times do we pass judgment on others without stopping to consider what personal challenges they might have faced in the past or are facing at this very moment? Everyone has a story. We don’t always know what it is, but we’re often quick to pass judgment. Excellent points! I’m learning we must know our characters well in order to portray them effectively to others. Which of your characters gave you the most trouble, and in what way? That’s a tough question. I’m not sure I’d say any of the characters gave me trouble. But if I had to choose one I might say Cammie because her visual impairment was challenging to write. Still, I didn’t want this to be just a story about a visually impaired girl. More importantly, I wanted it to be about a girl with hopes and dreams, a girl who isn’t about to sit back and let life happen to her, a girl who decides to change her life, someone who isn’t defined by the things that make her different, a girl who just happens to be visually impaired. I’ve come to have such respect for the blind and visually impaired. I’ve heard so many stories from my mother about some of the people she went to school with and some of the remarkable things they went on to accomplish. If my readers gain anything from this book, I hope it’s a better understanding about people who are living with physical challenges and the things they are capable of achieving. 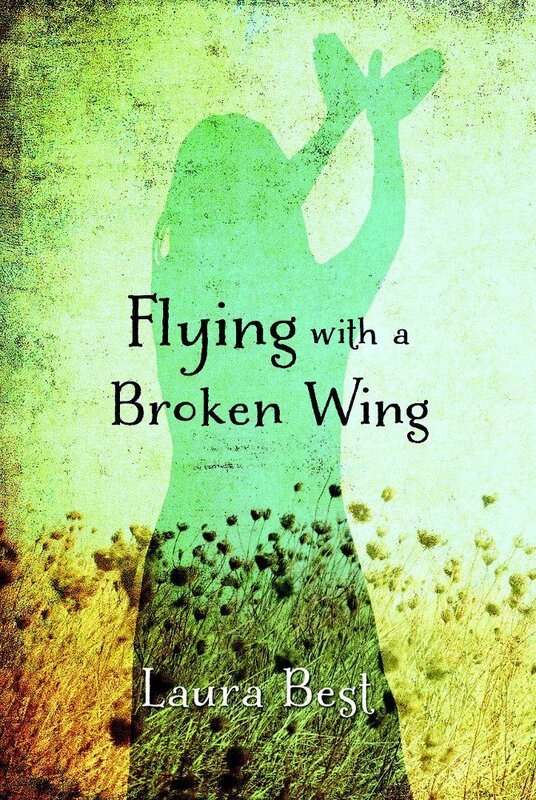 I believe readers of “Flying with a Broken Wing” will hear Cammie’s heart and root for her as I did. This is a book that should be encouraging to girls in whatever their situation. Which of your characters is the most like you in attitude and/or approach to life? I’m probably most like Evelyn Merry. I’m the person who offers support to others, who cheers for the underdog, and holds other people’s secrets close to my heart. There are names which can be considered unisex, my name being one of those, and you created a male character with a female name that is very unusual for a man, at least not one I had ever heard a man called. Why did you choose to do that? And why that name? I like unusual names. They tend to be the ones we remember, and I wanted Evelyn to be a memorable character, not simply Cammie’s sidekick. I’m really bad at choosing names for my characters but, thankfully, I have a book to look through. When I came across the name Evelyn, the book said that at one time it was a popular name in England for a man. I wasn’t sure in the beginning just how I felt about the name, but as time went on it really grew on me. I can’t imagine it being anything else. I love his name. It was really odd to me at first, but the more I got to know Evelyn the more I liked his name. Do you have another novel in the works since this one really leaves the reader hoping for a sequel? I’m working on several different stories at the moment. I didn’t plan for it to happen that way but it did. And while I am planning on a sequel to “Flying with a Broken Wing” my heart is pointing me in a totally different direction these days. I’m the type of writer who is led by the characters and the story. When a story demands that I work on it, and I try to ignore those demands, I’ll encounter all sorts of problems until I give in. While my logical mind might tell me to write one thing, I need to listen to the quiet whispers inside me. If I don’t pay attention I end up losing the joy in writing because I’m looking off into the future at the end result instead of enjoying the process along the way. So, for now, I’m working on a story that makes me truly happy and the sequel, I’m in the midst of writing, has been put on the back burner for a little while longer. I am so glad there will be a sequel! I think because you follow your heart is why your writing is so good. Is there anything you would like to add to this interview that I may have left out? I can’t think of anything I’d like to add only that it’s been fun, and some of your questions were quite challenging. I think that’s a good thing. Thank you so much, Lynn, for interviewing me about my latest book. Thank you, Laura, for agreeing to share your writing wisdom and experience with us again. I am learning from you. Now let’s give away a copy of your new book! This entry was posted in Reviews & Interviews, Writing and tagged author interview, book giveaway, Flying with a Broken Wing, girl power, Laura Best, Nimbus Publishing, post-war, visually impaired, win a book, YA fiction, Young Adult (YA). Bookmark the permalink. Great interview with a marvelous writer. I do hope that Laura’s short stories will someday be published in book form, which will add a whole new appreciative audience of readers to those who love her work already. Thanks, Syr. I, too, am waiting for a book of her short stories. Thank you for your comment. I love everything about this interview. Thanks Lynn and Laura. I also really liked Evelyn Merry and thought it was very clever to give him a name most commonly used for females. All the characters stuck with you, like next door neighbours. Perhaps that’s because I grew up in a small town too. I look forward to the next book Laura. Thanks for reading! I’m a firm believer that a story takes as long as it takes. I wrote my first novel in about 3 months. We just never know. As for flying with a broken wing, I think moving forward in life is sometimes challenging and something we need to keep trying at.. I’m glad to hear you’re doing just that! I enjoy that fact that Laura’s books are set locally. I’ve known Laura for years and very proud of her! I have known Laura all of my life I grew up with her, and she is a very smart caring, and loving friend. Her writing amazes me with every word that she writes. I really enjoyed the interview. Laura knows that I am not a reader as such, but I am really looking forward seeing what is going to happen to Cammie, and if she ever returns to Tanner in the next novel…. Thanks, Judi. Come visit me some time and I’ll tell you what’s up with Evelyn. 😉 Thanks for taking the time to read and comment. Thanks, Eric. This book has been read by a lot of adults, so hopefully, if you win, your mom will like it. 🙂 And you might, too! I read your review of “Flying with a broken Wing” Lynn. It sound like a great story. I’d be happy to be in the draw for it. I especially like that it is set in Nova Scotia. We vacationed there many times as a child. I have fond memories of it. Thanks for entering, Ginny. Many people have been drawn to the book because of the setting. Nova Scotia is a great little province! Thanks, Florence. I appreciate you taking the time to read and comment. 🙂 Glad you enjoyed the interview!